Lutherans have been ecumenically active, participating in dialogue with other major Christian Church bodies looking toward theological consensus, and participating in local ecumenical endeavors. Lutherans join with other Christian churches through the Lutheran Council in Canada to provide chaplains for military and institutional chaplaincies, in church communications, Scouting and other areas of ministry. The Evangelical Lutheran Church in Canada cooperates with Lutherans outside Canada through the Lutheran World Federation and with other Christians through the World council of churches, and the Canadian Council of Churches. Lutherans and Anglicans are in "Full Communion"
This means Lutherans and Anglicans are welcome to commune in either church. Ordained persons may serve in either church. There are over 70 million Anglicans world-wide. There are approximately 63 million Lutherans in the world with about 200 thousand in 642 congregations in the Evangelical Lutheran Church In Canada. The Lutheran Church as a movement within Christendom is traditionally dated from October 31, 1517, the day Martin Luther posted 95 theses in Wittenberg, Germany, questioning some of the practice in the church of his day, particularly the sale of indulgences. The term “Lutheran” was first applied in a derogatory way to the followers of the 16th century reformer. Luther objected to the name for a different reason. He wanted them to retain only the identification “Christian”, but “Lutheran” has stuck – for more than 470 years. With Bible, Catechism and Hymnbook packed among their belongings, Lutherans formed and important tributary to the stream of immigrants which poured into the New World. The winter of 1619 found a group of Danes, under Captain Jens Munck and with Captain Rasmus Jensen, conducting Lutheran worship services on the shores of Hudson’s Bay. The honour of being Canada’s first Lutheran congregation, however, goes to St. George’s of Halifax, founded by German settlers who accompanied Lord Cornwallis as Halifax was founded in 1749. Although part of the Anglican Church for the past 160 years, the church building, constructed in 1755, is shared by both denominations today. Not far away, in Lunenberg, stands Zion Lutheran church founded in 1772, the oldest continuing Lutheran congregation in Canada. In its tower hangs the bell which had once rung in the chapel tower of Fort Louisburg. Lutherans in Canada increased in numbers substantially after the American Revolution when many Americans of German background immigrated to Canada. Not long after, waves of German immigrants poured into Ontario, which by 1861 was able to organize its own Synod. A little later, as the West was opened, large numbers of German, Scandinavian and Icelandic Lutherans were among the founders of this vast part of our country. 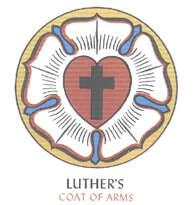 A cross on a heart, resting on the centre of the Messianic Rose and surrounded by a circle to symbolise eternity, was adopted by Martin Luther as his own Coat of Arms and as an expression of trust in God. "The Christian's heart is resting on roses even while beneath the cross it reposes." Reformation day is October 31st.